News organizations are now experimenting with innovative membership options to build brand loyalty and get paying users involved like never before. The era of holding an annual pledge drive, bringing in donations, and mailing out tote bags and mugs is over. These days, members of media outlets ranging from public radio stations to local news sites and niche publications expect a deeper level of engagement. News organizations need to recognize what members want in order to retain them — and keep their businesses afloat. Since 2011, almost 40 percent of U.S. daily newspapers have erected paywalls and many eventually realized that this revenue stream doesn’t scale. Meanwhile, print advertising revenue continues to decline, and digital ad dollars haven’t filled the void. 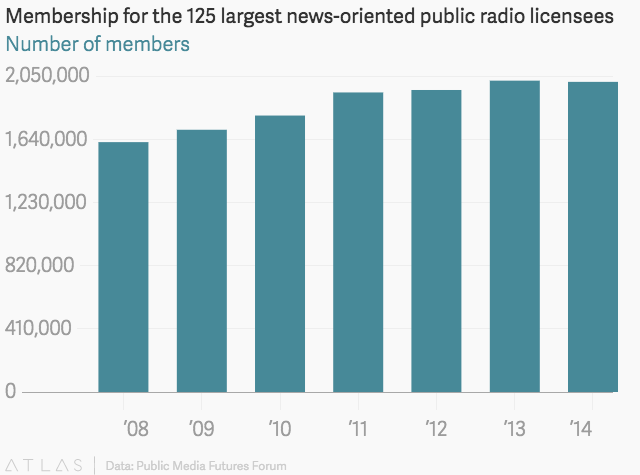 When paid subscriptions and advertising alone don’t cut it, membership can provide an additional revenue stream for news organizations with devoted followings. Membership is a longer-term loyalty option that strengthens the user’s identification with a specific media brand. The basic model typically includes perks for members, such as discounts on merchandise or members-only newsletters. News organizations tend to ask for donations monthly or annually and provide different tiers of membership. The Texas Tribune, a nonprofit state news organization, offers several tiers for members, with the highest contribution allowing access to the Chairman’s Circle. Some recent local news start-ups have given members the option of investing in or even owning a piece of the organization. Berkeleyside, which aims to serve Berkeley and the East Bay of San Francisco, has invited readers to invest in the company and get 3% annual dividends. The local site Haverhill Matters, serving a Massachusetts city 45 minutes north of Boston, features a co-op model. Nonprofit news organizations have also started holding events that break down the wall between the newsroom and the public. The Texas Tribune organizes a three-day festival packed with sessions and speakers of interest to devoted readers, while Voice of San Diego arranges town hall meetings with its executives and even trips to Mexico to address trade issues. Memberships aren’t a cure-all; as with paywalls, there are only so many readers who’ll pay. Public radio already experienced this phenomenon, which newer nonprofit sites are sure to encounter. Former NPR digital strategist Melody Kramer examined the struggle of public radio–a pioneer in the membership arena–to maintain a sustainable revenue model. She concluded that radio stations need to go beyond soliciting donations and find more innovative ways for listeners to contribute. For example, listeners trained in design and coding have worked on projects with local stations for the benefit of their community. Dutch journalism platform De Correspondent has drawn on professionals among its 47,000 paying members to contribute to journalists’ research. And Taproot Edmonton, a primarily member-funded Canadian news site, relies on members of the community to contribute ideas and ask questions for journalists to explore. The future of membership is moving toward increased audience engagement. For example, the podcasting company Gimlet invites listeners to a private Slack group to chat with staff and discuss shows. After introducing that feature, Gimlet experienced a 200% increase in new sign-ups. The Information also features a Slack community where the comments–many of which come from leaders in the tech world–rival the publication’s articles. But not every media outlet has the staff and back-end resources to run an effective membership program. Some sites, like local New Jersey outlet NJ Spotlight, have joined the centralized News Revenue Hub, a centralized platform led by Voice of San Diego. The San Diego publication assists smaller regional sites and nonprofit outlets with running e-mail and database management systems for their membership campaigns. As a result of this collaboration, NJ Spotlight needs only part-time help on its end to host events and take member inquiries. Although it remains to be seen how many readers and listeners are loyal enough to become paying members, the post-election period has proven that many Americans still value independent journalism serving the nation and their own communities — and are willing to pay for it. News organizations need to show members that they can go beyond passive consumption of journalism to play an integral role in its creation. The greatest untapped source of knowledge in journalism is the readers themselves. The co-op members will own Haverhill Matters the way depositors own credit unions and shoppers own food co-ops. All co-ops are governed on a one-member/one-vote basis, ensuring that Haverhill Matters will be a community institution in the deepest sense. All of the news organizations in the pilot provide a critical service in their field. By allowing them to outsource the complex database management and email marketing components of a membership program, it lets them focus on producing high-impact reporting and cultivating deeper relationships with their supporters. A failure in the coming years to push outside the existing envelope of membership will leave audience growth stalled, potential support diverted, and significant amounts of funding on the table. Featured photo by Jun used under a Creative Commons license. New organizations can do more than collect donations and instead create a collaborative relationship between those inside and outside the newsroom. Ernst-Jan Pfauth is a co-founder and publisher of De Correspondent. Mary Walter-Brown is publisher and COO of Voice of San Diego. Josh Stearns is the associate director of the Public Square Program at the Democracy Fund. Tom Stites is the founder and president of the Banyan Project. Amanda Michel is the senior editor of strategy and partnerships at the Guardian. Melody Kramer is the senior audience development manager at the Wikimedia Foundation. Andrey is a freelance journalist and publisher from Russia. He used to run the non-profit magazine 'Russia Without Us' and came to New York as a Fulbright scholar. He is mainly interested in revenue models for independent media and tools that let you build cool things on the web.